Capabilities of the Armed Forces are measured by the combination of doctrine and technology. In difficult situations a nation has to stand on its own feet as critical spares and ammunition are denied due to multifarious reasons. To fight through the fog of war self reliance is a must and every effort must be made to make defence indigenisation a success. It is pertinent to add that turning points in history like the breakup of the Soviet Union caused a difficult situation for our country as the spares were not available for 70 percent of our equipment which was of Soviet origin. Accordingly there is a need for India to develop intrinsic capabilities in the field of defence equipment. Indigenisation involves the Defence Research Development Organisation (DRDO), Defence Public Sector Undertakings (DPSUs), Ordnance Factory Board (OFB) private sector, the services and the political leaders. There is a need to find a way by which our indigenisation increases and imports reduce. 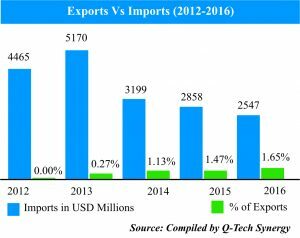 Currently about 70 percent of our equipment is imported and there is a need to reduce the percentage of foreign equipment in our inventory. There are immense opportunities in the field though the gestation period is very high. At the outset let us undertake a reality check. Let us start with the Light Combat Aircraft Tejas which despite induction has yet to get its Final Operational Clearance. Ab-initio development of the state of art technologies. Non availability of trained/skilled manpower in the country. Non availability of infrastructure/test facility in the country. Unanticipated technical/technological complexities faced in structural design. Non availability of critical component /equipment /materials and denial of technologies by technologically advanced countries. Enhanced user’s requirements or change in specifications during development. Increase in the scope of work. Inadequate production facility at Hindustan Aeronautics Limited. The above issues spell out the difficulties involved in indigenous production. It is important to note that the reply refers to the need for technology to produce equipment indigenously. Further even if a country receives technology, there must be the capability to absorb it. These aspects need knowledge, skill and dexterity. DPP 2016 has introduced a new procurement category, Buy (Indian-Indigenously Designed, Developed and Manufactured) abbreviated as Buy (Indian-IDDM). Higher indigenous content in Buy Indian raised from 30 to 40 percent. Revamped Make procedures to make them easy for the agencies. Two types of projects Make- I (Government funded) and Make-II (industry Funded). This would particularly benefit Micro Small and Medium Enterprises (MSME). Request for Information procedures institutionalised. Pricing to be more pragmatic using L1- T1 methodology. Provision to procure under a single bid made simpler. Validity of Acceptance of Necessity reduced to six months. Parameters for Service Qualitative Requirement divided into two parts Non Negotiable and Negotiable. This would broaden the Vendor Base. Threshold for Offsets increased from 300 crores to 2500 crores. In the case of the defence equipment the Defence Research Development Organisation (DRDO), Ordnance Factory Board (OFB) and Defence Public Service Units (DPSUs) have failed to develop cutting edge technologies needed for manufacture of high tech weapons. The performance of these organisations is good when they are assisted by foreign Original Equipment Manufacturers. By themselves they have not demonstrated any initiative despite heavy funding. The answer lies in permitting the private sector to enter the fray and use laboratories and research facilities of DRDO, OFB and DPSUs on a public private partnership to develop products which would be comparable to global standards. Technology would enter the defence field once a level playing field is created for the private player. The private player would invest based on realistic returns. World over high end research has been obtained as a result of the skills of Micro, Small and Medium Industries (MSMEs). About 6000 MSMEs operate across the country supplying the components and sub assemblies to DPSUs, OFB, DRDO and private players. The Government of India needs to encourage developing clusters with a view to integrate dispersed MSMEs into the supply chain of major programmes right from the very beginning. Foreign and Indian Original Equipment Manufacturers need to be encouraged to bid in consortia with MSMEs to enable risks to be shared proportionately. The main issue with MSMEs is finance which does not enable them to form a part of the bidding process in defence industry. MSMEs are more adventurous and innovative which results in technological breakthroughs which the defence industry is looking for. It is pertinent to note that states like Karnataka, Andhra Pradesh, Gujrat and Madhya Pradesh have created these clusters which favour capacity building through Research and Development. DPP 2016 in a very limited way encourages MSEME. MSMEs are more adventurous and innovative which results in technological breakthroughs which the defence industry is looking for. Technology needs investment. In consonance with this requirement Foreign Direct Investment (FDI) has been permitted in the defence sector. Currently FDI allowed is 100 percent with Government approval. 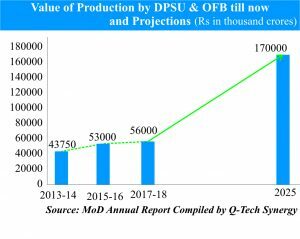 As per the Draft Defence Production Policy 2018, up to 74 percent in automatic route will be laid in niche technology areas. The Draft Defence Production Policy aims at achieving a turnover of Rs 170,000 crores in military goods and services by 2025. There are 13 military platforms and weapon systems which will be manufactured in India. They are fighter aircraft, helicopters, warships, combat vehicles, missile systems, gun systems, small arms, ammunition, explosives, surveillance systems, electronic warfare systems and night fighting enablers among others. The Draft DefenceProduction Policy is definitely setting difficult goals and the objective is extremely ambitious. The current production is around Rs 56,000 crores with an annual growth rate of seven percent. To reach a turnover of Rs 170000 crores would entail a three times’ increase in the next ten years would be extremely difficult. The current manufacture is being done by DPSUs and OFB which could be augmented by the private sector with pragmatic targets. The next aspect pertains to the export of arms which is around 2100 crores annually. The target set by the Draft Defence Policy is Rs 35,000 crores by 2025 which is a seventeen fold increase. This would certainly be enhanced by greater privatisation but difficult to reach the target which would need revision. The draft Defence Production Policy currently lists 13 items many of which are under production. This does not give the industry a clear perspective. It would be prudent to deduce a comprehensive list of items. This could be taken from the approved Long Term Integrated Perspective Plan which gives the Services requirements over a 15 years horizon, thereby enabling industry to visualise our capacity. The draft policy is a document of the Department of Defence Production which is not directly linked with the Director General of Acquisitions, the DRDO and the three Services. Implementation becomes difficult. A Task Force is needed under the Raksha Mantri for successful implementation. The draft Defence Production Policy does not assure the private sector of a level playing field. While it speaks of professionalization of DPSUs and OFs no mention is made of accountability.There is no mention of sticking to timelines for DRDO and research being undertaken by the private sector. It is interesting that the focus would be on Cyber Warfare and Artificial Intelligence. The most important aspect is the funding of Rs 77,000 crores by 2025 which would mean possibly about 11,000 crores annually. It would either mean an increase in the Defence Budget or disinvestment of some assets alternatively corporate bonds. The Way Ahead lies in firstly implementing the Make I and Make II procedures of DPP 2016. The projects pertaining to Futuristic Infantry Combat Vehicles and the Tactical Communications System are pending and both these projects could give a fillip to Make in India in the field of Defence. Another area that is pending is the business entities under the Strategic Partnership Model which would have seen a big boost to indigenisation. Further India has yet to move the Innovative Stage with regard to technology. India is currently in the Catch up stage with regard to technology in the field of manufacture of Defence equipment. This can be best done by Joint Ventures and Co Development.